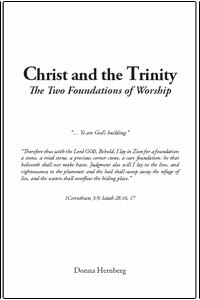 “Christ and the Trinity: The Two Foundations of Worship” is a 76 page treatise examining the Trinity as the foundation of the Christian church: “The Trinity, the central doctrine of modern Christianity, is under scrutiny. Christians who once believed in the Trinity are uprooting their faith from this foundation, and re-rooting their faith in Matthew 16:16, which declares that Jesus is “the Christ, the Son of the living God.” This has created a controversy in the Christian world, for those who have uprooted their faith from the Trinity for Matthew 16:16 make the allegation that these two foundations are incompatible. This study seeks for a better understanding of this controversy by comparing the Trinity and Matthew 16:16 as foundations” (D. Hernberg, Christ and the Trinity, p. 3). Christ and the Trinity Part Two, which examines the Holy Spirit, will be coming soon.